I'm going to be heading to the Clothes Show Live with Echo Falls again this year which I'm pretty excited about after having such a lovely time last year. If you want to join me and some other lovely bloggers at the Clothes Show Live then you're in luck because Echo Falls have given me two tickets to the Clothes Show Live to giveaway. The show runs from the 6th to the 10th of December at the NEC in Birmingham and you can choose which one of the days you wish to attend. I'm going up on the Sunday along with Sarah and a few other ladies and you will catch us hanging around at the Echo Falls wine bar. The Echo Falls wine bar will be a hub of activity over the duration of the Clothes Show live. You can stop by and enjoy some wine whilst getting a manicure, fashion tips and much more. The Clothes Show Live is at the start of December so I wanted something a little festive but practical at the same time. You spend a lot of time walking at the Clothes Show Live, browsing the stalls and watching demonstrations so I went for these cute but comfy shoes from Topshop. You don't want to have aching feet by the end of the day do you? They came in at £32. 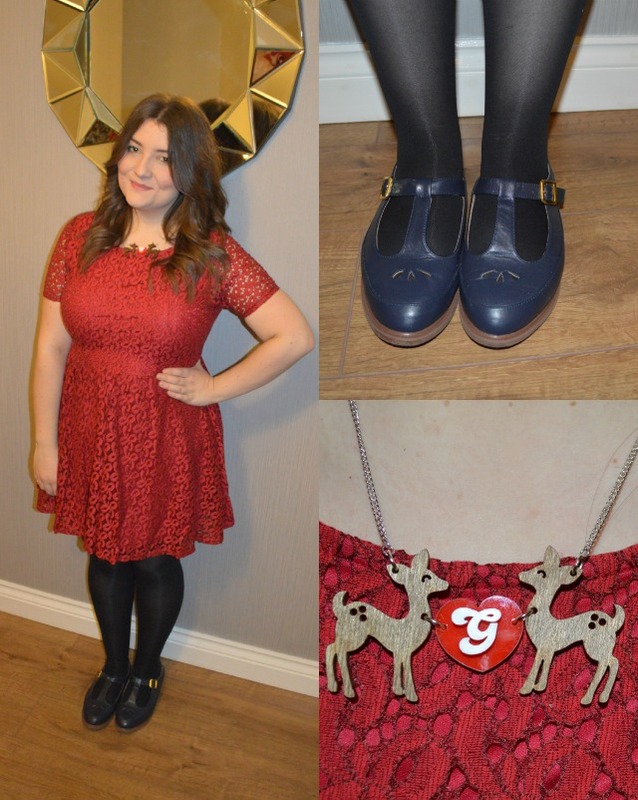 The dress is eye-catching and festive in this lovely deep red and a lace dress is a bit of a staple in my wardrobe. I had to get the necklace to finish the outfit off because it was just so kitsch and fun. It's only £13 from Punky Pins and I know I will be wearing this a lot over the Christmas period. Do you think I did well with my budget? The prize for the giveaway is a pair of tickets to the Clothes Show Live on any day you chose (travel is not included) and to enter you just need to fill in the form below. Are you heading to the Clothes Show Live this year? OOh, I used to love Punky Pins, I'm not sure why I stopped buying them, I had totally forgotten they existed! Ah those shoes Gem. I need them! Have fun at the Clothes show! That dress is so gorgeous - the colour is lovely on you! And I just adore those shoes :D I've been invited to the Clothes Show but I'm busy that weekend, such a shame! I would have loved to go! What fab choices you have made! I would definitely go with a fit and flare dress and a pair of ballet shoes! I would love to go to the Clothes Show Live! I have never been before and think it would be fantastic! With my £75 I would buy a new dress. I love dresses! !